Scale: It is 46 miles from Wombourne to Leek and 33 miles from Burton on Trent to Newcastle under Lyme. 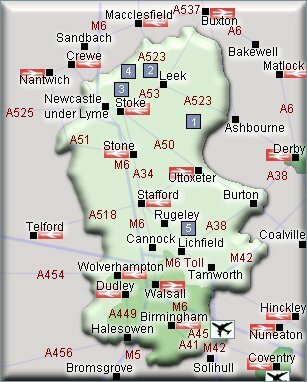 Airport indicated is Birmingham International. - Alton Towers, Alton, Staffordshire, ST10 4DB. Tel: 08705 20 40 60. alton-towers.co.uk. - Rudyard Lake and steam railway - near Leek, Staffordshire, ST13 8PF. Tel: 01538 306280. rudyardlake.com. - The Potteries Museum & Art Gallery, Bethesda Street, Hanley, Stoke-on-Trent, ST1 3DW. Tel: 01782 232323. - Biddulph Grange Garden, Grange Road, Biddulph, Staffordshire ST8 7SD. Tel: 01782 517999. nationaltrust.org.uk. - Lichfield Cathedral, 19A The Close, Lichfield, Staffordshire, WS13 7LD. Tel: 01543 306100. Alton Towers is in the county of Staffordshire, where beautiful countryside, historic houses and industrial heritage make it a county worth exploring. The six north Staffordshire towns of Tunstall, Burslem, Hanley, Fenton , Longton and Stoke - now all incorporated into the city of Stoke-on-Trent - have produced some of the finest pottery in the world during the last 300 years. Alton Towers, Alton, Staffordshire, ST10 4DB. Tel: 08705 20 40 60. Escape to the extraordinary world of Alton Towers, and share a year round resort of full on, time out experiences. Prepare yourself for the unexpected, where fun combines with world class theme park thrills. www.alton-towers.co.uk. Alton Towers is about 1 mile north of the small village of Alton. Alton Towers Packages. Escape to the extraordinary world of Alton Towers. Foxfield Steam Railway, Caverswall Road Station, Blythe Bridge, Stoke on Trent, ST11 9BG. Tel: 01782 396210. The Foxfield Railway is a preserved Steam Railway in North Staffordshire. Formerly built to carry coal, it now carries visitors on a five mile round journey through the picturesque Staffordshire Moorland scenery. The railway is home to some 28 Steam, Diesel and Electric locomotives along with a wide variety of Coaches. Visitors are currently advised to join the train at Caverswall Road Station. foxfieldrailway.co.uk. About 8 miles west of Alton. DARLEY MOOR Motor Cycle Road Race Club, DE6 2ET. Tel: 01246 866537. The home of British MotorSport. The 1.5mile Derbyshire circuit demands frantic breaking and wild acceleration. Off the A415 Ashbourne/Litchfield Road. darleymoor.co.uk. About 6 miles east of Alton. Calke Abbey, Ticknall, near Melbourne, Leicestershire, DE73 7LE. Tel: 01332 863822. Baroque mansion built in 1701-3 which has remained virtually unaltered since the death of the last baronet, Sir Vauncey Harpur- Crewe in 1924. Set in 750 acres of beautiful parkland, 18th century stable block, Gothic-style church, walled gardens and restaurant. National Trust. Charges apply. About 6 miles east of Burton on Trent. Chasewater Railway, Chasewater Country Park, Pool Road, Nr. Brownhills, Staffs, WS8 7NL. Brownhills West Station telephone and fax: 01543 452 623. Chasewater Heaths Station telephone (operating days only): 01543 682 854. www.chasewaterrailway.co.uk. About 3 miles east of Cannock. Weston Park, Weston-under-Lizard, Nr Shifnal, Shropshire, TF11 8LE. Tel: 01952 852100. One visit is all it takes to fall head over heels in love with Weston Park. It is a more engaging experience than any other stately home or castle. Its a love affair that captures everyone. As for children, theres the small matter of 1,000 acres of parkland in which to play. And an endless choice of special attractions including a miniature railway, Woodland Adventure Playground and the new Yew Hedge Maze and Orchard. www.weston-park.com. About 9 miles west of Cannock. Alton Towers, Alton, Staffordshire, ST10 4DB. Tel: 08705 20 40 60. Escape to the extraordinary world of Alton Towers, and share a year round resort of full on, time out experiences. Prepare yourself for the unexpected, where fun combines with world class theme park thrills. www.alton-towers.co.uk. About 4 miles east of Cheadle. Blackbrook - The Zoological Park of the Moorlands, Winkhill, near Leek, Staffs, ST13 7QR. Tel: 01538 308293. The zoological park of the moorlands, with rare birds, unusual animals, reptiles, insects, aquarium, children's pets and farm. Under - 5's indoor jungle playroom. Talks, displays and shop. www.blackbrookzoologicalpark.co.uk. About 5 miles north of Cheadle. Foxfield Steam Railway, Caverswall Road Station, Blythe Bridge, Stoke on Trent, ST11 9BG. Tel: 01782 396210. The Foxfield Railway is a preserved Steam Railway in North Staffordshire. Formerly built to carry coal, it now carries visitors on a five mile round journey through the picturesque Staffordshire Moorland scenery. The railway is home to some 28 Steam, Diesel and Electric locomotives along with a wide variety of Coaches. Visitors are currently advised to join the train at Caverswall Road Station. foxfieldrailway.co.uk. About 3 miles west of Cheadle. Rudyard Station, Rudyard, near Leek, Staffordshire, ST13 8PG. Tel: 01995 672280. Rudyard Lake Steam Railway is a narrow gauge steam railway located 2 miles North of the town of Leek in North Staffordshire. The present railway is 15 years old and is 10 1/4 inch gauge and is equivalent to about half of a full scale narrow gauge railway. About 2 miles north of Leek. Blackbrook - The Zoological Park of the Moorlands, Winkhill, near Leek, Staffs, ST13 7QR. Tel: 01538 308293. The zoological park of the moorlands, with rare birds, unusual animals, reptiles, insects, aquarium, children's pets and farm. Under - 5's indoor jungle playroom. Talks, displays and shop. www.blackbrookzoologicalpark.co.uk. About 5 miles west of Leek. Rudyard Lake - near Leek, Staffordshire, ST13 8PF. Tel: 01538 306280. The lake is named after the writer Rudyard Kipling, whose parents courted at this lake. Along one side of the lake is a pathway, perfect for family walks and bike rides. There is also a miniature railway, which runs along this walkway for 3 miles, spanning the length of the lake. Rudyard Lake is very popular for family days out, kayaking, boating .www.rudyardlake.com. About 2 miles north of Leek. Brindley Water Mill, Brindley Mill, Mill Street, Leek, Staffordshire, ST13 8HA. The Brindley Mill Preservation Trust maintains and operates a restored water-powered corn-mill built by James Brindley. The mill houses a small museum dedicated to Brindley's life and achievements. We don't have toilets, wheelchair access, refreshments, parking at the mill. www.brindleymill.net. Location: In the centre of Leek. Foxfield Steam Railway, Caverswall Road Station, Blythe Bridge, Stoke on Trent, ST11 9BG. Tel: 01782 396210. The Foxfield Railway is a preserved Steam Railway in North Staffordshire. Formerly built to carry coal, it now carries visitors on a five mile round journey through the picturesque Staffordshire Moorland scenery. The railway is home to some 28 Steam, Diesel and Electric locomotives along with a wide variety of Coaches. Visitors are currently advised to join the train at Caverswall Road Station. www.foxfieldrailway.co.uk. About 8 miles south of Leek. Hartington Cheese, The Old Cheese Shop, Hartington, Derbyshire. The Old Cheese Shop at Hartington is a much loved source of some of the finest cheeses you can buy in Britain. It has been a focal point of Hartington since it was opened in the 1980s and now showcases the best cheeses from the award winning Hartington Creamery. The shop stocks over thirty different British cheeses. www.hartingtoncheese.co.uk. About 8 miles east of Leek. Biddulph Grange Garden, Grange Road, Biddulph, Staffordshire ST8 7SD. Tel: 01782 517999. A rare and exciting survival of a high Victorian garden. Tunnels and pathways lead the visitor on a miniature tour of the world. Unique oriental pagoda garden with its own Great Wall of China. Victorian eccentricities. National Trust. Charges apply. (Photo &COPY; NTPL / Nick Meers). www.nationaltrust.org.uk. About 6 miles west of Leek. Churnet Valley Railway, Cheddleton Station, Station Road, Cheddleton, ST13 7EE. Tel: 01538 360522. Heritage railway based at Cheddleton station to the east of Stoke-on-Trent in Staffordshire. Stations at Leek Brook, Cheddleton, Consall, Kingsley and Froghall. churnet-valley-railway.co.uk. About 2 miles south of Leek. Chasewater Railway, Chasewater Country Park, Pool Road, Nr. Brownhills, Staffs, WS8 7NL. Brownhills West Station telephone and fax: 01543 452 623. Chasewater Heaths Station telephone (operating days only): 01543 682 854. www.chasewaterrailway.co.uk. About 5 miles west of Lichfield. Lichfield Cathedral, 19A The Close, Lichfield, Staffordshire, WS13 7LD. Tel: 01543 306100. The Cathedral has a splendid setting and a fascinating history. Its three spires are unique amongst medieval cathedrals and are often referred to as 'the Ladies of the Vale'. In the centre of Lichfield. Drayton Manor Park, near Tamworth, Staffordshire, B78 3TW. Tel: 08708 725252. Days out for all the family, theme parks, attractions, zoos, tourist attractions. Visit the Discovery Centre, where you come face to face with the wonders of Nature and conservation. www.draytonmanor.co.uk. About 5 miles from Lichfield. Drayton Manor Hotel + Ticket Packages - Everyone's favourite theme park! Featuring some of the biggest, wettest and scariest rides around! The Potteries Museum & Art Gallery, Bethesda Street, Hanley, Stoke-on-Trent, ST1 3DW. Tel: 01782 232323. The world's greatest collection of Staffordshire ceramics. A unique collection of works of art including Picasso, Durer and Degas. See a World War 2 Spitfire. Location: About 2 miles east of Newcastle-Under-Lyme. The Wedgwood Museum Trust Limited, Barlaston, Stoke-on-Trent, Staffordshire, ST12 9ES. Tel: 01782 282818. The Wedgwood Museum contains the world's greatest collection of Wedgwood ceramics, ranging from a unique collection of Josiah Wedgwoods original trials for the perfection of Queen's Ware. The Museum will reopen in 2007. About 2 miles south of Newcastle-Under-Lyme. Foxfield Steam Railway, Caverswall Road Station, Blythe Bridge, Stoke on Trent, ST11 9BG. Tel: 01782 396210. The Foxfield Railway is a preserved Steam Railway in North Staffordshire. Formerly built to carry coal, it now carries visitors on a five mile round journey through the picturesque Staffordshire Moorland scenery. The railway is home to some 28 Steam, Diesel and Electric locomotives along with a wide variety of Coaches. Visitors are currently advised to join the train at Caverswall Road Station. www.foxfieldrailway.co.uk. About 6 miles east of Newcastle-Under-Lyme. Staffordshire County Showground, Weston Road, Stafford, ST18 0BD. Tel: 01785 258060. The Showground is just 4 miles from Stafford Railway Station. The county's biggest show of livestock and agricultural events, food, music and more. www.staffscountyshowground.co.uk. About 7 miles north of Penkridge. SHUGBOROUGH ESTATE, Milford, Near Stafford, ST17 0XB. Tel: 01889 881388. Experience the beautiful sights, evocative sounds, real smells and true taste of The Complete Working Historic Estate. Set on the banks of the beautiful River Sow, and on the northern wooded fringes of Cannock Chase, Shugborough boasts 900 acres of historic parkland, working Georgian buildings and sublime gardens for you to explore. www.shugborough.org.uk. About 7 miles north east of Penkridge. Weston Park, Weston-under-Lizard, Nr Shifnal, Shropshire, TF11 8LE. Tel: 01952 852100. One visit is all it takes to fall head over heels in love with Weston Park. It is a more engaging experience than any other stately home or castle. Its a love affair that captures everyone. As for children, theres the small matter of 1,000 acres of parkland in which to play. And an endless choice of special attractions including a miniature railway, Woodland Adventure Playground and the new Yew Hedge Maze and Orchard. www.weston-park.com. About 6 miles west of Penkridge. Staffordshire County Showground, Weston Road, Stafford, ST18 0BD. Tel: 01785 258060. The Showground is just 4 miles from Stafford Railway Station. The county's biggest show of livestock and agricultural events, food, music and more. www.staffscountyshowground.co.uk. About 3 miles east of Stafford. SHUGBOROUGH ESTATE, Milford, Near Stafford, ST17 0XB. Tel: 01889 881388. Experience the beautiful sights, evocative sounds, real smells and true taste of The Complete Working Historic Estate. Set on the banks of the beautiful River Sow, and on the northern wooded fringes of Cannock Chase, Shugborough boasts 900 acres of historic parkland, working Georgian buildings and sublime gardens for you to explore. www.shugborough.org.uk. About 3 miles east of Stafford. Weston Park, Weston-under-Lizard, Nr Shifnal, Shropshire, TF11 8LE. Tel: 01952 852100. One visit is all it takes to fall head over heels in love with Weston Park. It is a more engaging experience than any other stately home or castle. Its a love affair that captures everyone. As for children, theres the small matter of 1,000 acres of parkland in which to play. And an endless choice of special attractions including a miniature railway, Woodland Adventure Playground and the new Yew Hedge Maze and Orchard. www.weston-park.com. About 9 miles south west of Stafford. Little Moreton Hall, Congleton, Cheshire CW12 4SD. Standing on the borders of Cheshire and Staffordshire, Little Moreton Hall is a striking black and white timber-framed building, complete with moat. Long gallery with an important collection of paintings. Tel: 01260 272018. National Trust charges apply. About 6 miles north of Stoke on Trent. Rudyard Station, Rudyard, near Leek, Staffordshire, ST13 8PG. Tel: 01995 672280. Rudyard Lake Steam Railway is a narrow gauge steam railway located 2 miles North of the town of Leek in North Staffordshire. The present railway is 15 years old and is 10 1/4 inch gauge and is equivalent to about half of a full scale narrow gauge railway. About 5 miles north of Stoke on Trent. The Potteries Museum & Art Gallery, Bethesda Street, Hanley, Stoke-on-Trent, ST1 3DW. Tel: 01782 232323. The world's greatest collection of Staffordshire ceramics. A unique collection of works of art including Picasso, Durer and Degas. See a World War 2 Spitfire. Location: In the centre of Stoke on Trent. The Wedgwood Museum Trust Limited, Barlaston, Stoke-on-Trent, Staffordshire, ST12 9ES. Tel: 01782 282818. The Wedgwood Museum contains the world's greatest collection of Wedgwood ceramics, ranging from a unique collection of Josiah Wedgwoods original trials for the perfection of Queen's Ware. The Museum will reopen in 2007. www.wedgwoodmuseum.org.uk. About 5 miles south of Stoke on Trent. Foxfield Steam Railway, Caverswall Road Station, Blythe Bridge, Stoke on Trent, ST11 9BG. Tel: 01782 396210. The Foxfield Railway is a preserved Steam Railway in North Staffordshire. Formerly built to carry coal, it now carries visitors on a five mile round journey through the picturesque Staffordshire Moorland scenery. The railway is home to some 28 Steam, Diesel and Electric locomotives along with a wide variety of Coaches. Visitors are currently advised to join the train at Caverswall Road Station. www.foxfieldrailway.co.uk. About 5 miles east of Stoke on Trent. Biddulph Grange Garden, Grange Road, Biddulph, Staffordshire ST8 7SD. Tel: 01782 517999. A rare and exciting survival of a high Victorian garden. Tunnels and pathways lead the visitor on a miniature tour of the world. Unique oriental pagoda garden with its own Great Wall of China. Victorian eccentricities. National Trust. Charges apply. (Photo &COPY; NTPL / Nick Meers). www.nationaltrust.org.uk. About 8 miles north of Stoke on Trent. Staffordshire County Showground, Weston Road, Stafford, ST18 0BD. Tel: 01785 258060. The Showground is just 4 miles from Stafford Railway Station. The county's biggest show of livestock and agricultural events, food, music and more. www.staffscountyshowground.co.uk. About 6 miles south of Stone. The Wedgwood Museum Trust Limited, Barlaston, Stoke-on-Trent, Staffordshire, ST12 9ES. Tel: 01782 282818. The Wedgwood Museum contains the world's greatest collection of Wedgwood ceramics, ranging from a unique collection of Josiah Wedgwoods original trials for the perfection of Queen's Ware. The Museum will reopen in 2007. www.wedgwoodmuseum.org.uk. About 4 miles north of Stone. Hartshill Hayes Country Park, Oldbury Road, Hartshill, Nuneaton, Warks, CV10 0TE. Phone 01827 872660. The country park, covering 137 acres of woodland and open hilltop has magnificent views across the Anker Valley. The Visitor Centre includes an interpretive display, and a shop selling leaflets, gifts, hot and cold drinks, chocolate bars and crisps. About 6 miles from Tamworth. Drayton Manor Park, near Tamworth, Staffordshire, B78 3TW. Tel: 08708 725252. Days out for all the family, theme parks, attractions, zoos, tourist attractions. Visit the Discovery Centre, where you come face to face with the wonders of Nature and conservation. www.draytonmanor.co.uk. About 2 miles from Tamworth. Twycross Zoo, Burton Road (A444), Atherstone, Warwickshire, CV9 3PX. Tel: 01827 880250. Set in 50 acres of parkland, known for its apes and monkeys, breeds endangered species such as gorilla , chimpanzee, bonobo, many rare monkeys, parrots and other birds. Also elephants, lions and giraffes. Pets corner, adventure playground, penguin pool, picnic areas, train and donkey rides. Catering outlets, shops, children's area. www.twycrosszoo.com. About 5 miles north east of Tamworth. Staffordshire County Showground, Weston Road, Stafford, ST18 0BD. Tel: 01785 258060. The Showground is just 4 miles from Stafford Railway Station. The county's biggest show of livestock and agricultural events, food, music and more. www.staffscountyshowground.co.uk. About 8 miles west of Uttoxeter. SHUGBOROUGH ESTATE, Milford, Near Stafford, ST17 0XB. Tel: 01889 881388. Experience the beautiful sights, evocative sounds, real smells and true taste of The Complete Working Historic Estate. Set on the banks of the beautiful River Sow, and on the northern wooded fringes of Cannock Chase, Shugborough boasts 900 acres of historic parkland, working Georgian buildings and sublime gardens for you to explore. www.shugborough.org.uk. About 8 miles south west of Uttoxeter. Alton Towers, Alton, Staffordshire, ST10 4DB. Tel: 08705 20 40 60. Escape to the extraordinary world of Alton Towers, and share a year round resort of full on, time out experiences. Prepare yourself for the unexpected, where fun combines with world class theme park thrills. www.alton-towers.co.uk. About 7 miles north of Uttoxeter. DARLEY MOOR Motor Cycle Road Race Club, DE6 2ET. Tel: 01246 866537. The home of British MotorSport. The 1.5mile Derbyshire circuit demands frantic breaking and wild acceleration. Off the A415 Ashbourne/Litchfield Road. www.darleymoor.co.uk. About 7 miles north east of Uttoxeter. The Big Top Fun Centre, off Town Meadows Way (behind Tesco) Uttoxeter, (01889) 566604. It is a great place to take children from birth to 11 years old. It comprises of a large play frame and baby and toddler area. Refreshments are available at reasonable prices. Chidlren's parties are also catered for. Open every day except Christmas Eve, Christmas Day and Boxing Day 10-6. At the rear of the playbarn is Uttoxeter Gymnastics Club. Location: In the centre of Uttoxeter. Dudley Concert Hall, St James's Road, Dudley, West Midlands, DY1 1HP. This attractive venue in the heart of Dudley, with the magnificent castle as a backdrop, is the largest venue in the Borough. Car park nearby, Flat access to building. A pleasant bar lounge is available, with a licensed bar facility. Tel: 01384 815577. Location: About 4 miles east of Wombourne. St Benedict Biscop, Wombourne has been at the heart of the village for over 1,000 years. Wombourne CC is a cricket club based in the village playing in the Staffordshire Club Cricket Championship (2006-7). It has a large social community as well as having bowls and tennis sections. Himley Hall Golf Centre. Log Cabin, Himley Park, Himley Road, Dudley, DY3 4DF. Tel: 01902 895207. 9 / 18 hole parkland par 70 golf course. 9 hole Pitch &amp; Putt - short golf course. PGA Golf Professional - all ages welcome. www.himleygolf.com. Location: About 1 mile east of Wombourne. Wombourne Swimming Pool. Ounsdale Road, Wombourne, Wolverhampton, West Midlands, WV5 8BJ. Tel: 01902 898 202. Wombourne Leisure Centre has an impressive 25-metre swimming pool incorporating 6 lanes and a spectators seating area. Dudley Museum & Art Gallery, St. James's Road, Dudley, West Midlands, DY1 1HU. Tel: 01384 815575. There is something for everyone at Dudley Museum & Art Gallery. The most important collection at Dudley Museum is Geology. Many watercolours are kept at Dudley Museum. Boats in stormy weather. Artist: Charles Napier Hemy (1841-1917). Location: About 4 miles east of Wombourne.